A portrait of a family coping with mental illness, Infinitely Polar Bear is, it seems to me at least, a movie constructed with a mainstream audience very much in mind. 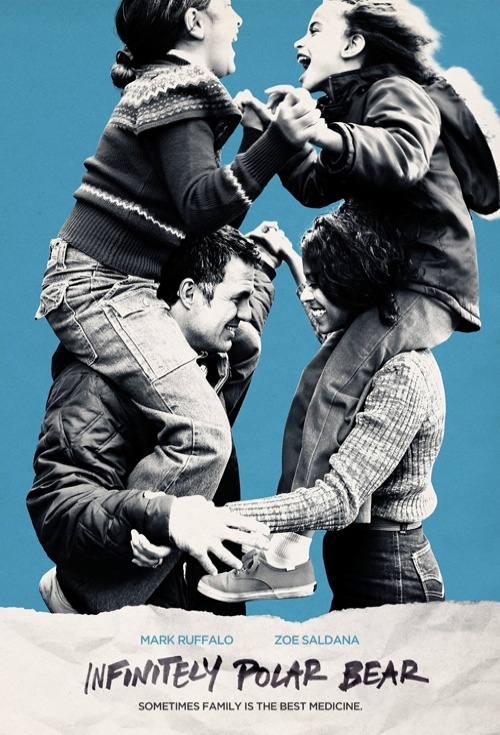 Written and directed by Maya Forbes and apparently drawn from her own experiences as a child, Infinitely Polar Bear offers a somewhat rose-tinted view of the characters and their plight. Mark Ruffalo throws himself in to the role as Cameron, a father of two living with manic depression and bipolar who is desperate to reconcile with his wife Maggie (Zoe Saldana) and children. With autobiographical stories such as this, it is hard to know how much of what we see is real and how much has been exaggerated, or underplayed, at the hands of the filmmaker. In this instance, the issue is explored with a light touch and I couldn’t help but feel as though the reality of this situation would be much more difficult than what transpires here. However, that is not to say that the film doesn’t offer some insights into a familial dysfunction that the vast majority of us will never experience or truly understand. When we first meet Cameron and Maggie, they seem to be enjoying an idyllic life in Cambridge, Massachusetts with their two daughters Amelia (Imogene Wolodarsky) and Faith (Ashley Aufderheide). Cameron presents as eccentric (but not overly reckless or dangerous), taking the girls out of school for the day to go wandering in the forest. Then, without warning or any real explanation, Maggie is bundling the girls into the car in a bid to flee the family home. Cameron, needless to say, is understandably upset when he arrives on the scene and a stand-off ensues; Maggie huddles with the girls while Cameron pleads for her to reconsider or, at the very least, explain why she is taking this action. This is an explanation that the viewer needs as well because the lack of context makes it hard to reconcile with what happens later on. If Cameron is some kind of threat to Maggie or the girls, we are yet to see that and it makes her behaviour difficult to understand, particularly when Cameron is carted off to a mental hospital and the next time we see him he is a zombie-like figure doped to the hilt and unable to engage with his family. Everything happens so quickly it seems as though the filmmakers were more focused on keeping to a 90 minute running time rather than fleshing out the events in sufficient detail. One minute, Cameron is incommunicative in hospital, the next he is living by himself in a small apartment and the next he is being asked to take responsibility for parenting the girls while Maggie heads off to Columbia Business School in New York. The same woman who believed he was too dangerous to stay with the family at all now deems him responsible enough to take care of the kids. Obviously, the haste with which all this transpires is to get to the “fun” as Cameron tries – with varying degrees of success – to manage his illness whilst caring for the two girls, although there is a distinct reversal of responsibilities much of the time as the kids try to reign in Cameron’s more outlandish impulses. 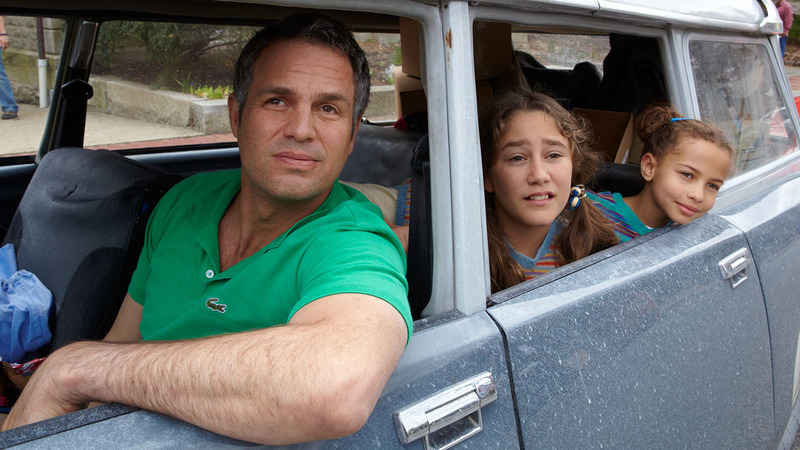 Ruffalo is equal parts delusional and delightful in the lead role, making his character sympathetic and believable. His erratic behaviour is often more amusing than troubling, even if the girls are mortified by his eccentricities. Saldana is also fine enough as Maggie, a character whose treatment of Cameron makes her very hard to like, and both Wolodarsky and Aufderheide are impressive in their first film roles. The film touches on issues such as racial identity – at one stage the light-skinned Amelia seeks assurance that she is black after being taunted at school – and is stinging in its critique of the American public education system as Maggie’s primary motivation for attending Columbia is to be able to afford to send the girls to a private school where they will, apparently, be assured a better education. Is her absence justified simply in order to send the children to an elite school? Was she not able to attend college much closer to home? Told in such a concise and somewhat simplistic manner, Infinitely Polar Bear is entertaining enough but ultimately emerges as a feel-good picture that lacks sufficient depth to really have a lasting impact.